Please contact the owner @ 415-596-7271 or keith@denebeim.com...This Pearson 26OD currently located on Lake Travis, Austin, Texas was built in 1981; Hull #252 (of 262 built) and was completely re-done in 2018 including new (Snow White) Awlgrip paint job. Deck was painted and re-gripped. New teak handrails and all wood trim. 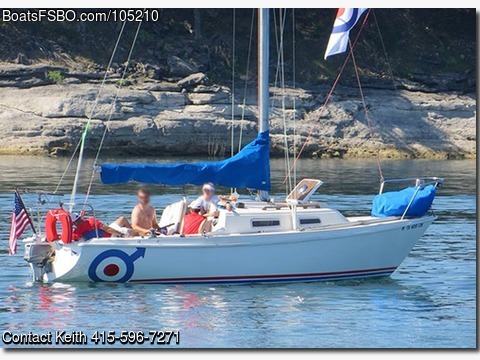 The boat is in top condition in every way and is a proven race winner at the Austin Yacht Club. Sails included: NEW full batten mainsail in 2018 New 155% Genoa in 2017 New 122% jib new 2017 New 90% jib in 2018 New (white) symmetrical spinnaker in 2017 The interior is the classic Pearson 26 OD with freshly varnished wood and trim. No signs of cracking or mold. Cushions are in very good condition. AM/FM/Disc/USB Stereo and speakers, VHF Radio, Depth and knot meter. Dual 12-volt battery system with a solar panel trickle charger. Dual speed fans in the V-berth. Two-color white/red interior cabin light. Custom interior sail bags for storage. Brand new Tohatsu 6.6 outboard with battery charger alternator; purchased; Nov 2018 (8 total hours on engine) Framed cockpit bimini top for shade in the summer Plenty of additional equipment and no detail has been left out This is a true "turn-key" boat ready to cruise or club race.